Due to its performance and interior layout capabilities, the N55 became one of the most popular, and one of the most tested models we’ve produced. We designed the 60-foot version of the N55 platform to meet owners’ demands for increased space. 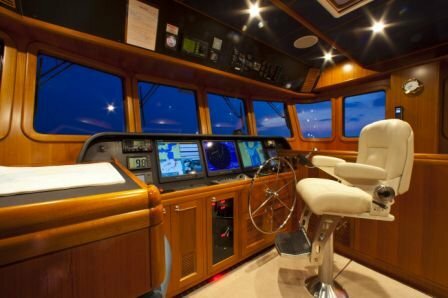 The 63 is actually an aft wheelhouse version of the N60 and its extended cockpit and boat deck. Looks-wise, however, the new model retains the same salty feel that popularized the Nordhavn 62. For those who love the N62 but have a width restriction at their slip, the N63 may be the perfect choice with its 18-foot beam. One of PAE’s greatest qualities is the ability of our Chief of Design, Jeff Leishman, and his engineering staff to continually conceive, design and introduce exciting new models. 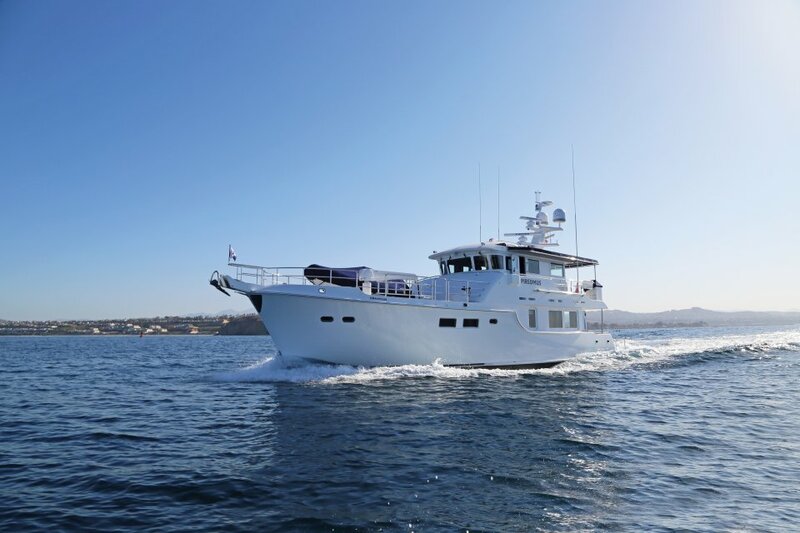 While the 63 shares the same hull as the N55/60 designs, an entire new deck and engine room mold have been created for it, providing increased interior volume and added amenities. For instance, just forward of the engine room door on the 55/60 sits the utility room with washer/dryer and freezer. 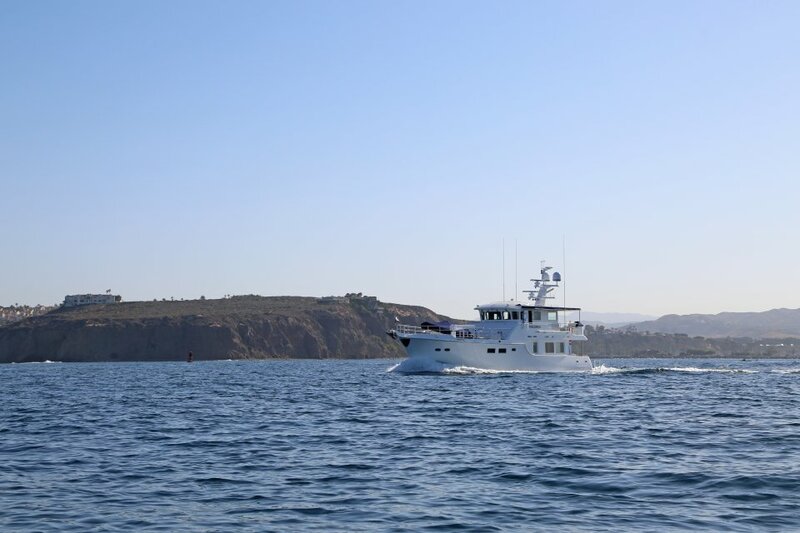 On the 63, this area has been expanded to also include a crew quarters to port with fixed berth and pipe berth at the forward end. Another layout change is the centerline guest stateroom and four large opening port lights, both of which come standard. Perhaps the greatest attribute of the N63 is realised while stepping through the cockpit door. 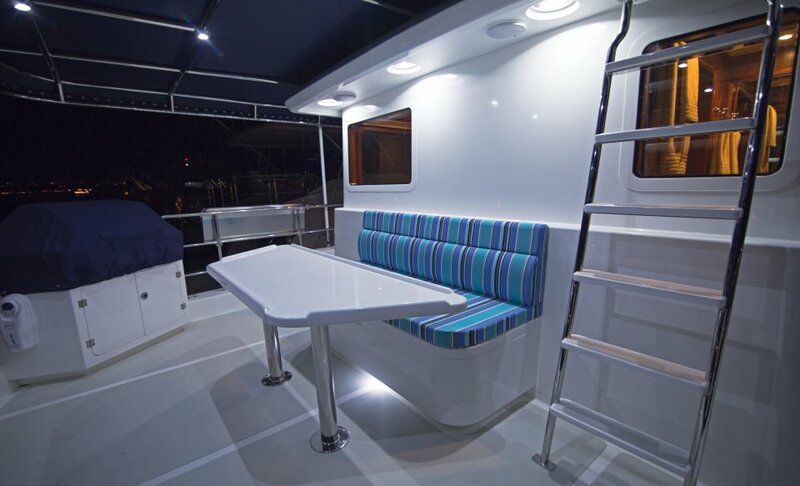 Not only is this boat incredibly spacious, it exudes luxury. 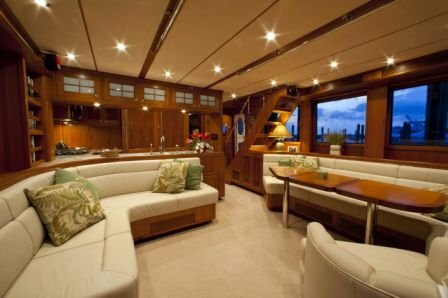 Standard on the 63 is the same raised panelled cherry wood that was ordered on hull #1 of the Expedition Yachtfisher (N75 EYF). 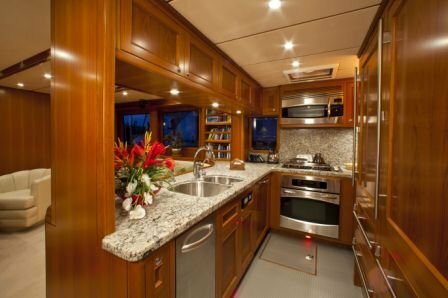 And in the galley is a 700 Series Sub-Zero refrigerator and freezer, as well as a U-Line freezer in the utility room, providing enough storage for extended travelling. 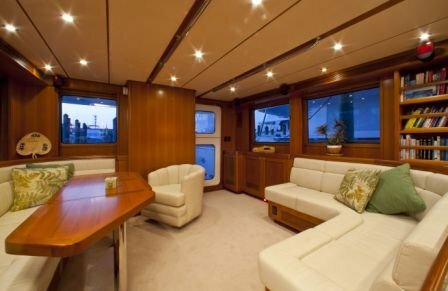 The main saloon is larger than both the 55 and 60 and offers two wrapping settees for entertaining with the galley on the same level. 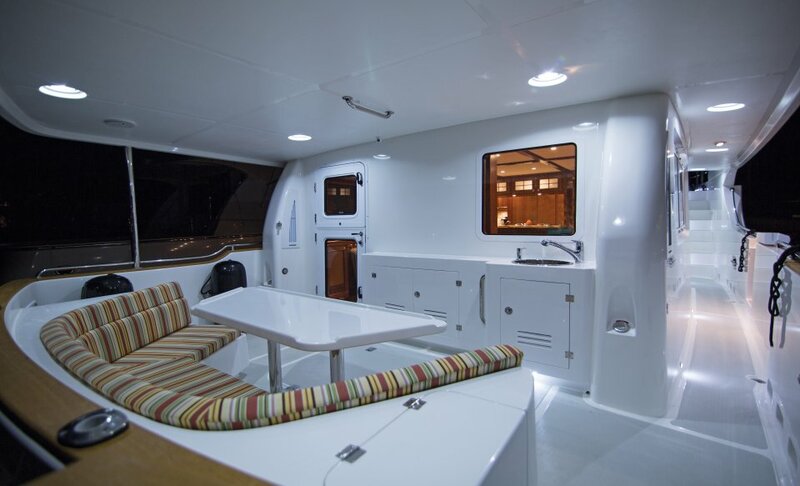 A unique hatch alcove on the port side of the Portuguese bridge allows light and air below to the galley; it sits just above the GE stainless steel LPG four-burner stove and convection/microwave oven. Like all Nordhavns, granite countertops are beautifully crafted from your selection of our latest array of samples. 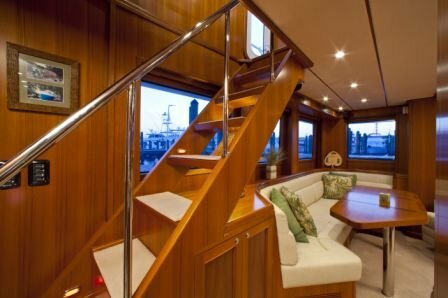 Two steps below the main saloon you will find the master cabin near amidships on the port side. 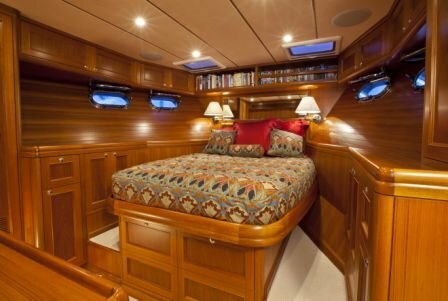 A walkaround bed facing athwartships with two large ports creates a light and airy feeling in the cabin. 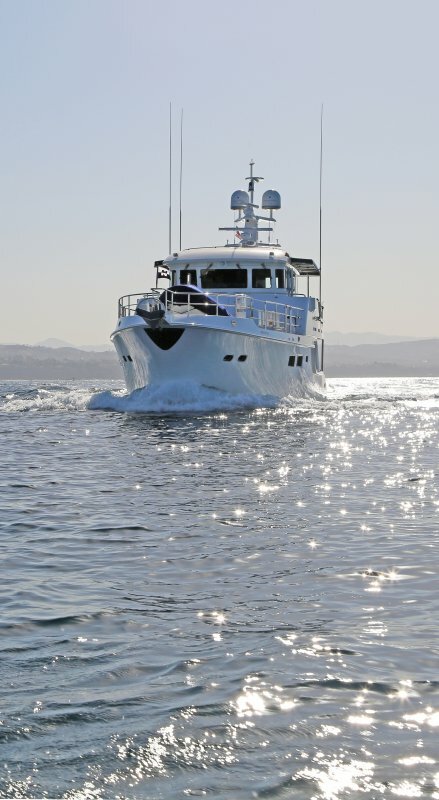 The master head is designed to please the first mate. The space and furnishings in all areas are intended to be as welcoming as they are beautiful. 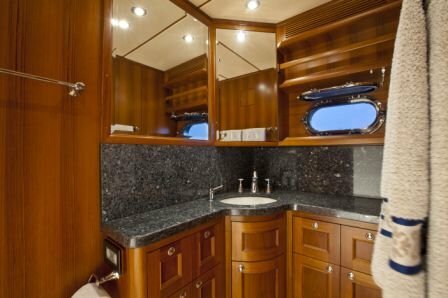 Opposite the master cabin on the starboard side is the day head which is convenient to the main saloon and is complete with shower and opening ports for light and air. 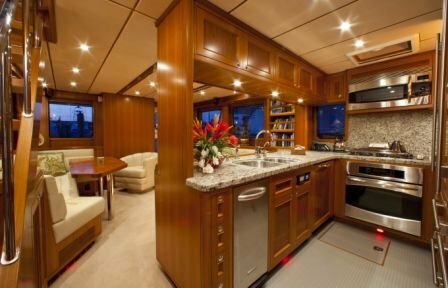 Forward to the bow is the guest cabin which rivals the master cabin with its port lights, a walkaround bed on centre line, drawers and cedar lined closets for clothing storage. 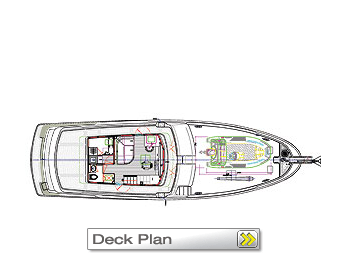 amidships for ease in docking. 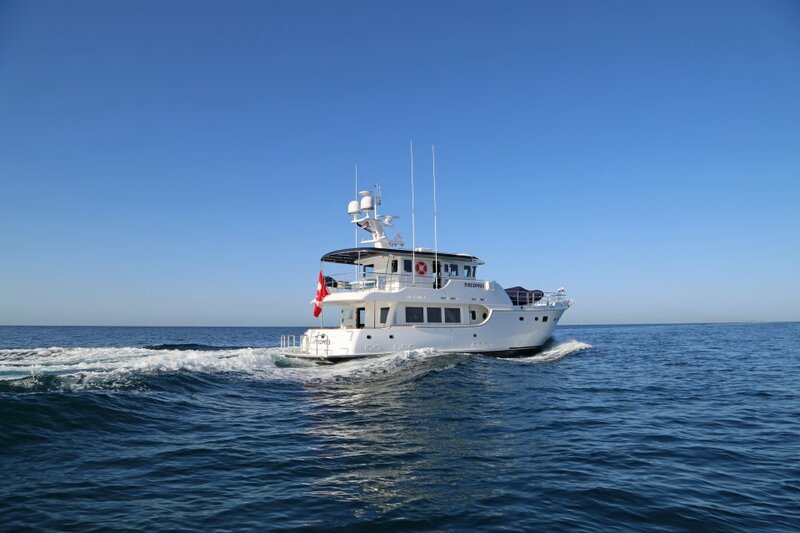 The large open foredeck can support a tender as large as 15’ and it comes standard with a Steelhead ES 1500 telescoping yacht crane with a 1500-lb. safe working load. 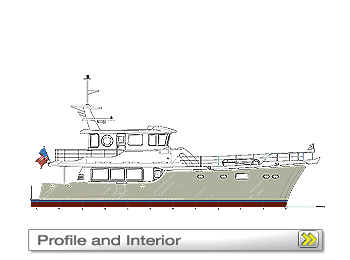 Another design cue taken from the N75 EYF is the updated dry stack which trails aft of the radar platform and forms the support for the dual tracking domes atop the pilothouse. Inside of joint: 2 layers M & W.R.
Engine instrument panel: deluxe with instrumentation for oil pressure, water temperature, voltage, revolutions, hour meter, alarm, & powerview. T.V. 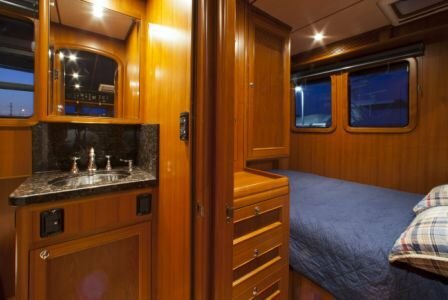 alcove located on the bulkhead at the foot of the master bed for optional flat screen T.V.